The only thing that puts a bigger smile on my face than traveling to an exotic destination is doing so for nearly nothing. 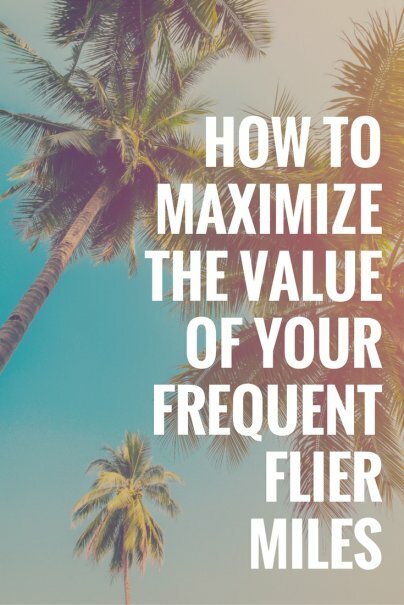 Frequent flier miles can give us that opportunity, but only if we use them carefully. Just like when paying with dollars, travelers should always be on the lookout for the best deals to ensure they are getting their money’s worth when it comes time to redeem an award. The first step to ensuring you are getting a good deal is to understand how much your points and miles are worth. For example, airline miles were once valued at two cents each, but thanks to increasing restrictions and capacity controls on awards, most experts now consider them to be worth closer to one cent each. Why is this important? On my last trip from Denver to Chicago, I paid $180 in cash because I concluded it was not worth it for me to redeem 25,000 miles for an award for the same flight. By only realizing .72 cents per mile, I would have received far less in value for my miles than they their value to me. In contrast, on my recent trip to Israel and Italy, I redeemed 120,000 miles per business class ticket, worth about $7,000 each. This returned an excellent value of 5.8 cents per mile and was certainly a worthy use of my miles. It used to be that an airline either had an award seat available or they didn’t. Today, most airlines offer their awards in a number of tiers, with much more mileage being required for flights where only the highest tiers remain. It is tempting to give up in frustration after failing to find the seats you want at the lowest redemption levels, but don’t give up. Search for awards as far in advance as possible, but keep looking throughout the year. And stay flexible, both in the dates of travel and in the possible routings you are willing to accept. For example, I am willing to make additional stopover on an international award in business class rather than pay for the most direct routing in coach. One of the most beautiful aspects of award travel is that most airlines allow one or more additional stop-overs, an open-jaw itinerary, or both. For example, one could fly from New York to Rome with a stop-over in London. In this case, Rome is the destination, while London is merely the en-route stopover. Most airlines define a stopover on an international itinerary as a stay of more than 24 hours, so it is even possible to overnight in several different cities along your route. An open-jaw itinerary is one that proceeds from a city other than the last destination. For example, you could fly into Melbourne, Australia, and return via Sydney without having to book a flight between those two cities. Adding permitted stopovers and open jaws allows you to visit additional cities and make creative use of alternate transportation within your award travel plans. The key to unlocking real value in airline awards is to discover all of the partners an airline is allied with. For example, many people do not realize that Delta SkyMiles can be redeemed for carriers serving exotic destinations such as Air Tahiti Nui, China Southern, and Kingfisher airlines of India. I don’t blame these people for their ignorance, as Delta’s website won’t offer even these partner flights when searching for award seats. Customers are asked to call a reservations center where shockingly, their own agents may even be unfamiliar with all of their airline’s published partnerships. In many cases, it is necessary to politely hang up and call back in order to speak with a properly trained representative who can book your award travel on an obscure partner. Most airlines do not show all partner award seats on their website, and their agents may not be motivated to exhaustively search for the awards you need. Nevertheless, there are ways to put in your own legwork in order to find award seats on partner airlines. The easiest way is to find another airline that is also partners with the carrier whose seats you are looking for (as long as it does have an functional partner-award search tool). For example, Al Nippon Airways of Japan has a web site that will allow you to search for partner awards across all 30 carriers of the Star Alliance, the same coalition that United, Continental, and US Airways is a part of. Since the Australian carrier Qantas is part of the Oneworld Alliance which includes American Airlines, travelers can search for American’s partner awards by creating a free account at Qantas.com. Finally, many of Delta’s partners list their award space at Air France’s web site. In each of these instances, you will have to spend some time methodically searching for the award seats you are looking for and telephoning the airline to book them after you have discovered available award seats. Fortunately, when partner awards seats are available, they are always offered at the lowest mileage levels. If you don’t have the time or patience for this kind search, there are third-party tools, such as Expert Flyer and the KVS search tool, that can automate some of this work. For the ultimate service, you can simply hire an award travel specialist to do the work for you, such as BookYourAward.com and PointsPros. In response to traveler’s frustration with unredeemable frequent flier miles, banks have been promoting cash-back credit cards as an alternative to airline cards. At the same time, some airlines like Southwest and JetBlue have eschewed mileage systems in favor of programs that offer points worth a fixed value towards the price of any flight. While some travelers will appreciate the simplicity and predictability of such systems, people like myself will continue to hunt for the highest value award seats. In my experience, enjoying a sleeper seat in business class during a 12 hour flight is always worth effort I spent to find the award.